Great Food, Live Music & Gardening Inspiration! We’re getting REALLY excited for our 8th annual Incredible Edible Plant Sale. This event is festive and fun with great food, lively music, activities for the kids and some very garden-centric artist vendors. Be sure to tell your friends and family, don’t miss it! We have over 270 varieties of veggies, fruits, and herbs on order with about 30 new varieties. The IE Plant Sale Plant Description List is now on our web site for your planning pleasure. Time to make your wish list and remember volunteers get Early Bird shopping privileges! The Sellwood Marimba Band, Possum Six-Pack & Joe Kym are just a few of the musicians graciously volunteering their performances for us! These fun workshops are scheduled throughout the day to inspire and provide education for new adventures in growing your own food! Glean some great vegetable gardening tips from Master Gardeners Dennis Brown & Robin Greenwood. We are also very excited to have chef Leather Storrs from Noble Rot restaurant and Katherine Deumling of ‘Cook with What You Have’ offering inspiration for how to best utilize your harvest! Our Incredible Event is for young and old alike. Tell your family and friends with kiddos and be sure to drop by the Kids Grow station for garden science hands-on activities for the kids – led by a stellar crew of education conscience MGs. Kids will be discovering the wonders of the natural world and growing! Victory Garden of Tomorrow - Artist Joe Wirtheim brings his gorgeous, thought and action provoking posters to the Incredible Edibles sale. Victory Garden of Tomorrow is committed to civic innovation and social progress - better food, better gardens, and better cities. It is artful advocacy for the modern home-front. To see Joe’s stunning collections of garden signs, posters, towels and patches, check out the Victory Garden of Tomorrow website. Feeling Lucky? Be sure to buy raffle tickets for a chance to win some incredible prizes, all thanks to our generous donors! 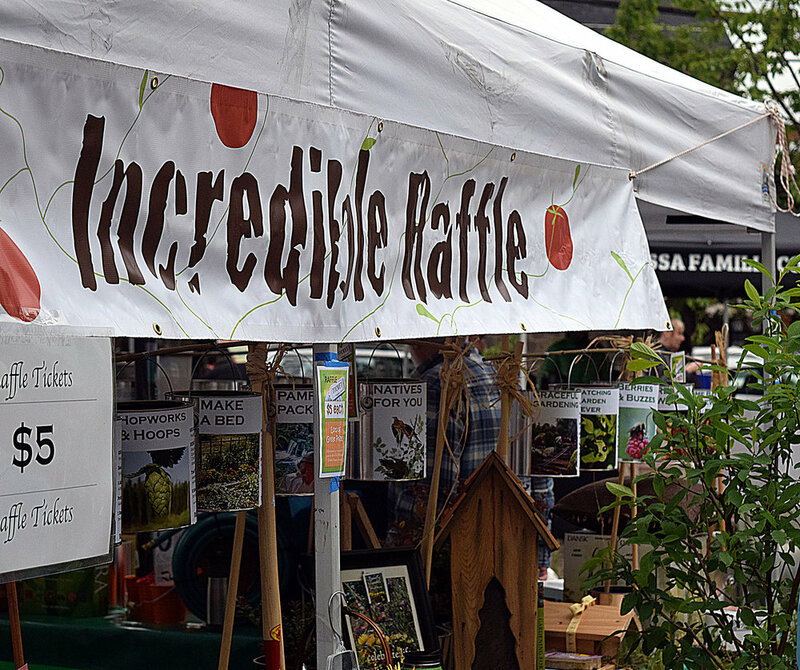 Prizes and packages from many local, sustainably-minded restaurants, garden gear, and much, much, more!